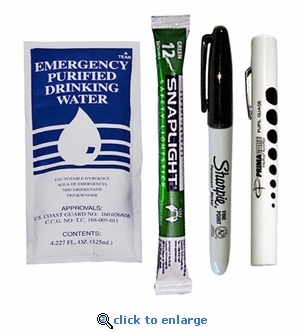 This 5-Year Medical Refresh Kit is an easy and cost effective way to replace expired water and other items in your existing EMT style medical kit. Most medical and first aid kits on the market have items that expire after as little as 2 years. Don't wait for an emergency to find out your kit has expired and non-usable first aid items. * Items expire 5.0 years from the date of manufacture. The picture above is of FA-902-2R 100-Person Trauma Kit 5.0-Year Refresh and is not a true representation of this item. This kit contains the contents listed in the description area under Kit Contents.